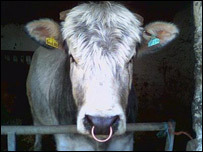 Number 128 is a jersey cow, she has beautiful brown eyes and cannot resist having a nibble of my microphone. As she stares at me she is constantly chewing... and burping. She could be producing as much as 500 litres of methane per day. There are more than two million more like her across the UK. They are the UK's biggest single source of methane - a gas 23 times more potent than carbon dioxide when it comes to global warming. 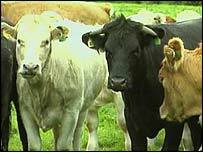 In fact cattle are responsible for about 3% of all Britain's greenhouse gases. Reduce that and experts say you not only make farming greener and more efficient, it could help Britain achieve its commitments under the Kyoto agreement. Scientists across the UK are working on ways to tackle the problem. "Cows don't ruminate anymore," concludes Professor David Beever, an expert on nutrition with feed producer Richard Keenan and Co. He believes that their food is not chewy enough, so they do not break it down in their mouths before it gets to their rumen. It is inefficient and produces more methane. Part of his solution is to cut their silage feed to make it longer or chewier - "it's like adjusting the carburettor". "Instead of perhaps 35 litres of methane per litre of milk, it could be as low as 25 or 20." Elsewhere in labs and farm yards scientists are trying out inoculations, microbes or even extracts of garlic. "Methane's a short-lived gas in the atmosphere," says Dr Christian Jardine, a senior researcher at the Environmental Change Institute at Oxford University. "So if we can reduce our methane emissions now, that will allow us to buy time for technologies to come in place to reduce our carbon dioxide emissions." But what of the government's response - is it targeting a gas that could make big differences, quickly? Dr Jardine says: "The government doesn't really have any direct policies targeting methane emissions." The Department for Environment, Food and Rural Affairs (Defra) disagrees. "Agriculture has a key role to play in addressing climate change. The government's climate change programme, published in March this year, sets out a range of measures to help agriculture to both adapt to and reduce its impact on the climate," a spokesman said. "Continuing to improve production efficiency and reduce emissions is a key part of our vision for One Planet Farming." But others think there should be an even wider, holistic approach. Agriculturalist Professor Chris Pollock believes farmers, scientists and politicians need to look at agriculture's entire environmental footprint. "You need to have a common currency that allows scientists to look at benefits in one area and disbenefits in another." A feed additive which reduces methane, he explains, would be of no use if it has to be transported half way around the world, burning up fossil fuels. As he puts it: "How much milk yield is a red squirrel worth?"